Gulab Jamus is known as one of the most popular Indian dessert, isn’t it? But the fact is, it’s not an Indian dessert. Aren’t you curious to know where did Gulab Jamum come from? Well, you will be surprised to know that Gulab Jamun came to India from Persia or modern day Iran with our Muslim sultans and badshahs. The Indian gulab jamun dish originated from an Arabic dessert called Luqmat Al-Qadi and became popular during the Mughal era. The later name, gulab, actually comes from the two Persian words gul (flower) and ab (water). Gulab Jamun, as the history goes was first prepared in medieval India derived from Persian invaders. Gulab Jamun, a small waffle shaped balls deep fried and dipped in sugar syrup, popular in countries of the Indian subcontinent as India, Pakistan, Nepal and Bangladesh. The term Gulab jamun comes from Persian, Gulab means rosewater referring to the rosewater scented syrup and jamun from the Hindi language, a South Asian fruit with similar size and shape. It has been a well-known folklore in India that Gulab Jamun was first accidentally prepared by the chief Persian priest of Mughal king Shah Jahan. And at the time of Mughals ruling India, it was introduced to the Indians, as a royal dessert. Gulab Jamun is traditionally and historically associated with India and it’s one of the most revered sweet dishes in the subcontinent today. This favourite Indian dessert originated in the Mediterranean and Persia where it is called as luqmat al qadi. Originally, luqmat al qadi (the original dish) is made up of dough balls deep fried, soaked in honey syrup and sprinkled with sugar but in India we modified the recipe and named it Gulab Jamun. According to the culinary historian Michael Krondl, both luqmat al-qadi and gulab jamun may have derived from a Persian dish, with rose water syrup being a common connection between the two. Gulab Jamun is a traditional Indian sweet made by kneading khoya, flour and milk into a soft dough. Then small balls are made and deep-fried in clarified butter i.e. ghee till golden brown. These ball are then soaked in cardamom flavored sugar syrup and served hot (not piping hot … but slightly warm). Here we bring you an authentic Gulab Jamun recipe common in India that’s not only quick but, can be easily made at home. 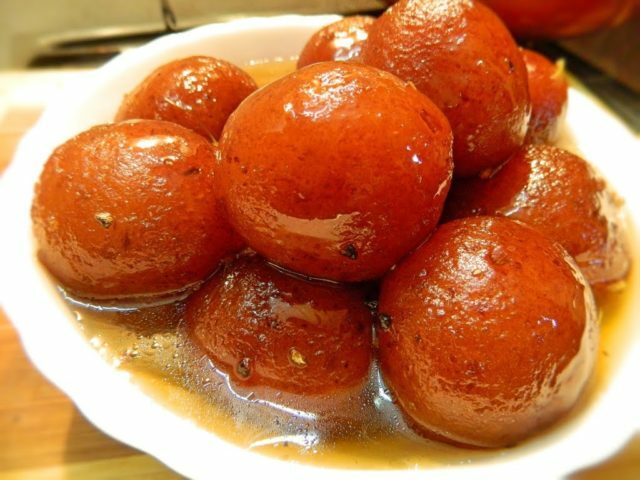 The Gulab Jamun recipe we listed below is most basic of Indian recipes also one of the tastiest! In a large pan, dissolve the sugar in 1 1/2 cups of water and bring to a boil. Simmer over a slow flame till the syrup is of 1 string consistency. Add the saffron and keep the syrup warm. 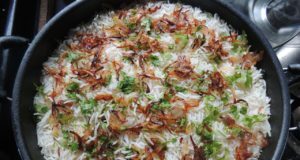 In a bowl, combine the khoya (khawa), flour and cardamom powder and mix well. Knead to a firm dough without using any water. Divide this mixture into 25 equal portions and roll into rounds. These should have no cracks on the surface as otherwise the Gulab Jamuns will crack while frying. Refrigerate for 10 to 15 minutes. Deep fry in ghee over a slow flame till the Jamuns are golden brown in color (approximately 10 to 12 minutes). Drain and immerse in the warm sugar syrup. Soak for 30 minutes. Now days, ready-made Gulab jamun mixtures are also available in the market, all you have to do is knead it, fry it, soak and gallop.